﻿Heat 3 table spoons of ghee in a pan. Fry sooji until golden brown and keep it aside. Boil 2 cups of water in a pan and add sugar. Stir until the sugar dissolves. Now add fried sooji to it mix well. Reduce the flame. Close the lid and cook for 2 to 3 min. in a low flame. Switch off the flame. Add ealichi powder and mix well. 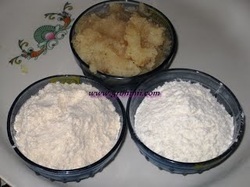 Mix wheat flour and maida, add salt and knead to a soft dough adding sufficient water. Add some 2 tea spoons of oil mix well cover it and leave it aside for 20 to 30 mins. 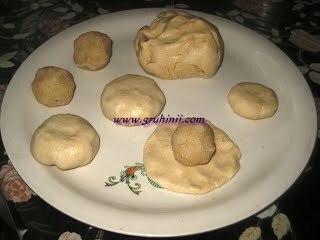 Make lemon size balls of the dough and Halwa separately. Now take a maida ball spread it like a small poori with hands (it should be thick in the middle and thin at the edges) and place the halwa ball over it. Cover it by bringing the edges together. 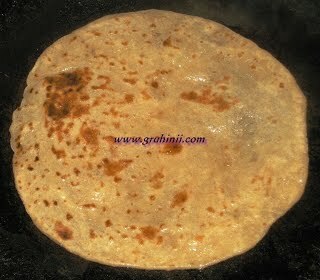 Now roll to circular Chapatis and fry on a frying pan until golden color in a medium flame by adding 1 to 2 tea spoons of ghee or oil around the poli. 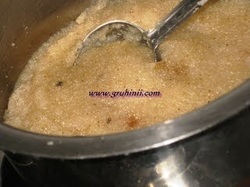 Halwa poli...Sajjappalu.. are ready........Enjoy. In the same manner you can make smaller ones (poori size) and deep fry in oil, which are called Halwa pooris. Tip: You can also make this snack with left over halwa too.